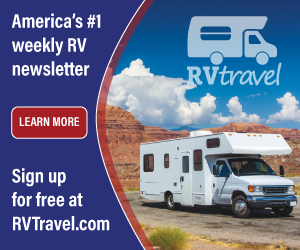 If you are wont to travel in your coach during the chilly fall or early spring months, or if you are a serious winter RVer, then you fully understand the importance, convenience and satisfaction of having a fully functioning RV heating system. If not, spend an involuntary cold night in temperatures near freezing or below without heat and you’ll soon wish you did have that understanding! Unlike the cozy warmth of a well-insulated and heated conventional home, the typical RV lacks the depth or robustness of residential-style insulation and the advantage of multiple layers of construction materials separating you from the rage of a cold wintry night. All too often I receive frenetic correspondence from coach owners suffering from a malfunctioning furnace, stuck in the midst of their travel, relying perhaps on a small inefficient space heater, shivering under a heating blanket, wondering what they might do. At that point, my sage but simple advice would be to add another blanket! However, with a little forethought and a few preventive steps (performed now, before Old Man Winter awakens from his respite), you can enjoy those crisp mornings and evenings in comfy warmth, year after year. 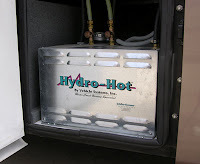 Over the course of RV history there have been a few different types of heating systems employed, but today’s coaches are equipped typically with at least one, if not a couple of direct-spark forced air furnaces or a hybrid system using hydronic heat for both hot water and comfort heating. Earlier coaches were outfitted with radiant heaters, often better quantified as gravity heaters, or in the case of much smaller RVs, catalytic units. Catalytic is still a viable option for the smaller pickup campers and towables even today. Other antiquated combo permutations that date back to the 1970s include a combination heater/stove/oven, (Duette), and a heater/water heater amalgamation, (Thermal Twin); both nightmares to service because of their compactness and individual quirkiness. I’m sure the younger RV technicians today are dumbfounded when one of these old combo units rolls into the service bay! The first thing to understand is that all recreation vehicle LP-burning appliances, for optimum performance, require some degree of annual maintenance. Just read any user’s guide from any RV appliance manufacturer and it will often state, in so many words, that very sentiment. And because of its design and operational characteristics, regular maintenance of the RV heating system is a must. Today’s larger rigs can enjoy never-ending hot water and multiple heating zones provided by hydronic heating units. Hydronic heating systems provide a continuous supply of hot water for the fresh plumbing system plus comfort heat for the interior. Employing a diesel-fired burner or a propane burner, combined with 120-volt AC heating elements, these types of “on-demand” systems are much appreciated and handy for those slightly chilly mornings. The diesel or propane burner can be bypassed using heat supplied by an electric heating element, thereby conserving on-board fuel. About the only regular maintenance required by the owner is to keep an eye on the level of the 50/50 (water/anti-freeze) solution in the reservoir tank. Additionally, diesel units require an annual cleaning of the fuel nozzles and a new fuel filter, while the propane-fired units require an annual cleaning and servicing and delivery source pressure testing like any other propane appliance. Aside from checking the coolant level, most all other maintenance tasks are usually performed by a trained RV service technician. But because of their sheer numbers, the main focus here will be the forced air furnace; by far the most popular choice among coach manufacturers today. At the root level, a forced air furnace draws in fresh air from outside the vehicle, mixes it with propane and burns it in a sealed combustion chamber (a firebox to all the old-timers). 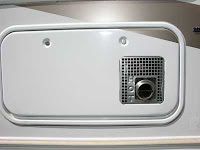 A blower then blows interior air over the heated chamber and into the living portions of the motorhome through a system of ducts or in the case of some smaller Class C motorhomes and travel trailers, directly out of the front of the furnace grill (blow-through design). Most of the supplier manufacturers use this same design strategy. They may employ slightly different components and possibly a different sequence of operation, but by and large, most follow this same basic premise. From a comprehensive annual maintenance standpoint, a detailed furnace clean and service procedure involves removal from the coach, partial or complete disassembly, new gaskets and a full bench evaluation; all outside the realm of the typical RVer. A clean furnace is a happy furnace. A trite statement? Perhaps, but true. As air moves in, out and around the furnace, dust, lint and other pollutants in the air will naturally accumulate. Too much accumulation and furnace failure is all but guaranteed. Each furnace is typically equipped with two blower wheels or squirrel cages; one to bring in fresh air to mix with the propane, and one to “force” the air over the heated chamber and push it through the coach ducting to the interior living sections. 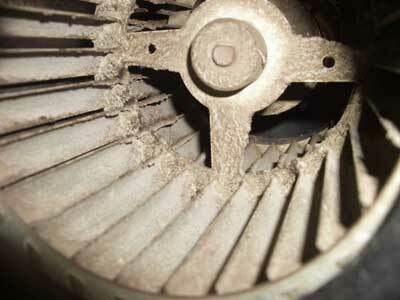 Excess dirt and lint wedges itself inside the blower assembly, essentially weighing it down. In a normal sequence, the spinning of the main blower wheel closes a device called a sail switch (so named since this small electrical switch is outfitted with a large “sail” or paddle that catches the air moved by the blower wheel). Even though adjusting the wall thermostat actually initiates the heating cycle, it’s the closing of the sail switch that starts the internal electrical sequence of furnace operation. If the blower wheel is weighted down with excess dust and lint, (see photo), it will not spin fast enough to close the sail switch (also called an “air prover” switch, by the way). 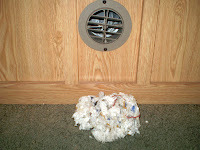 It “proves” the fan is spinning fast enough, bringing in enough air to support combustion. Too much weight, the slower the spin; the slower the spin, the sail switch does not close. An open sail switch; the furnace fails to ignite. Here’s where to start: With the thermostat in the off position, the LP container service valve completely off and the furnace at room temperature, vacuum in, around and about the innards of the furnace. It will likely be necessary to remove a front cover or access panel to expose the main furnace assembly. 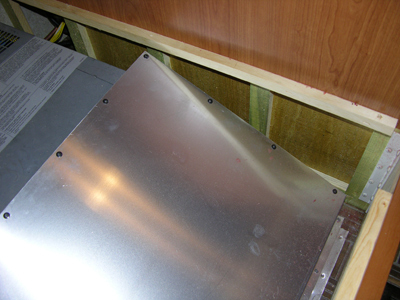 In the photo shown here, it will be necessary to remove the aluminum plenum to gain access to the main furnace unit. If you have compressed air available, while vacuuming, blow out all internal sections of the furnace. Be sure to wear the appropriate eye protection, as dust and dirt will certainly be blown about. The goal is to keep the insides of the furnace assembly as clean as possible. Wipe all surfaces down with a damp shop rag. 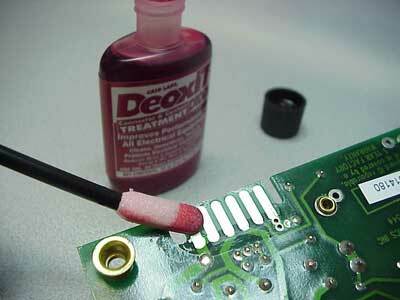 Where the circuit board is easily accessed, take the time to clean the board contacts. At a minimum, use a pencil eraser to brighten the contact strip, or better yet, use an electrical cleaner/preservative to chemically remove oxides from the contacts. (Check out this product used by the RV Doctor). At the very least, unplug then plug the connector in a few times. Oftentimes, just a simple “scraping” of the terminal contacts by plugging in and unplugging will restore a heating cycle. If the wall thermostat is the older mechanical type, it is still possible to clean and preserve the contact points as you would the circuit board above. There are multitudes of these simple, bi-metallic types out there. If yours looks the one in the photo, it will be necessary to remove the clear plastic cover to expose the two contact points. Cleanliness of the warm air ducting is also crucial. Some heating systems incorporate a central, manifold ducting system either in the floor or the ceiling. Others simply have individual ducts running above the floor, under cabinets, through partition walls to each major section of the coach. Regardless of the type of delivery ducting in your rig, remove each register and vacuum as far into each duct as possible. Take care not to rip or tear the 4-inch round flexible ducting, if so equipped. The duct in this photo, discovered during an annually cleaning procedure, turned out to be the perfect location for mice to nest! Not only a fire hazard, it certainly contributed to erratic furnace operation. 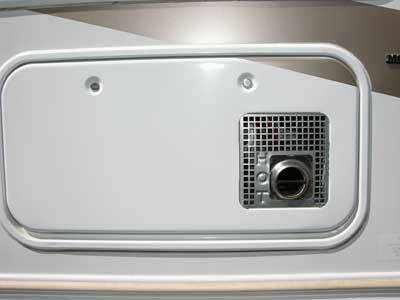 On the exterior of the RV, inspect the intake and exhaust vents carefully. Use a flashlight if necessary. If the coach has been inactive for a period of time, it’s common to find mud daubers or wasp’s nests inside the cozy confines of the vent tubes. Blockages in the intake tube can result in an overly rich fuel mixture, creating operational faults. 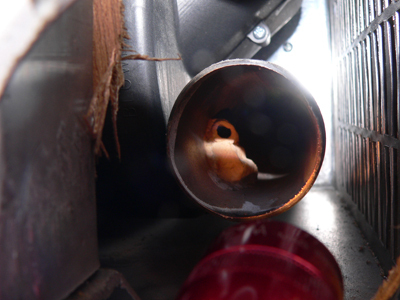 Blockages in the exhaust tube can result in overheating, short cycling of the furnace and pose a fire hazard. Apply compressed air to the fresh air intake while covering the exhaust tube with a running vacuum cleaner. Probably the number one cause of flawed heating cycles in forced air systems today is low battery voltage. Furnace fan motors can create a relatively large amp draw on a malnourished battery bank. Add the excess weight of filthy blower wheels and current usage ramps even higher. When dry camping, the minimum voltage requirement for most all 12-volt DC forced air furnaces is 10.5-volts DC, measured at the furnace. Conversely, when plugged into shore power, running off the converter output, excessively higher than normal DC voltages (above 13.5-volts DC), can create their own palette of problems for the delicate components found on some circuit boards. 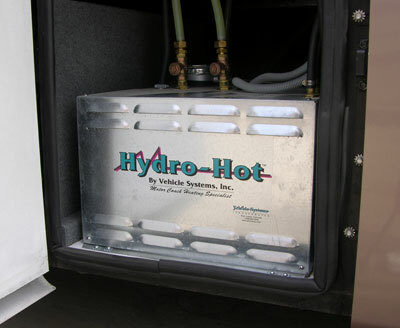 Maintaining a properly charged battery bank is critical for optimum furnace operation. 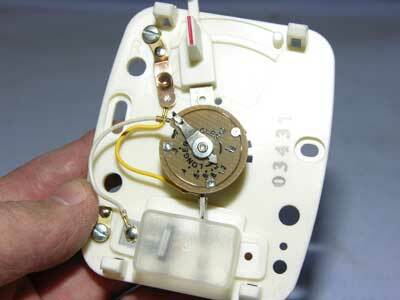 Low voltage will cause the blower wheels to spin at a reduced rotation. Remember that earlier progression? Low voltage; less blower speed. Not enough blower speed and the sail switch will not close, regardless how clean those squirrel cages may be! Maintaining a healthy battery bank assures you’ll have enough current on hand for the heating system. Aside from the cleanliness issue mentioned above, for those coach owners with individual runs of 4-inch flexible ducts, inspect and straighten all sharp bends or turns whenever possible. Shorten any lengths that appear too long. One of my pet peeves about the way some RVs are produced centers on how some installers simply snake excess ducting back and forth under cabinets rather than taking the time to cut them to the proper lengths. Excess duct lengths will eventually create an overheated situation within the furnace housing and prohibit sufficient heat delivery throughout the living sections. Thankfully this is usually not a concern for floor or ceiling ducts. Also realize that furnace manufacturers mandate a minimum requirement for the number of ducts, based on the BTU rating (size) of that particular furnace. Take the time to look up the requirements of your furnace and ensure the heating system is sufficiently ducted. I’ve seen the simple addition of another duct eliminate a short cycling condition of a seemingly faulty furnace. That said, I find it altogether too common for inexperienced service technicians (or owners) to blame a furnace component (and the furnace manufacturer by default), for a comfort-heating failure caused by something other than the appliance itself. An informal poll once found that the clear majority of “faulty” circuit boards returned to the factory under warranty were actually fault-free; absolutely nothing wrong with them. Trust troubleshooting/repair procedures only to Certified or Master Certified service technicians. Perhaps more important than an unobstructed heated air duct, a clear path of return air to the furnace enclosure is nothing short of a mandate. 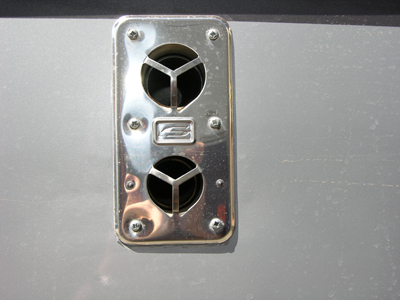 A literal “breathing” appliance, the forced air furnace must also inhale fresh breaths of return air as the warm air is circulated throughout the RV in order to operate optimally. 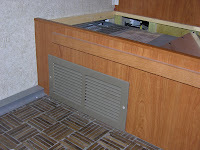 You’re probably aware of at least one interior vent located near the furnace compartment, such as in this photo of one under a dinette seat. This is the pathway of return air back to the furnace compartment. Some coach owners mistakenly install a filter in this vent space; a definite no-no. Unlike a home heating appliance, there should not be a filter installed anywhere in the path of the return air. Additionally, never stow gear or supplies in the furnace compartment. Aside from a fire hazard, it may inhibit the path of the necessary return air. Just like the required number of ducts, furnace makers calculate just how much volume of return air is necessary for their unit to operate properly. The size of the return air grill is further deduced to ensure the return air passage meets the minimum number of square inches of free-flowing air as specified for that particular model of furnace. In some cases, coach manufacturers may even modify the cabinetry to meet these minimum requirements. In this photo it appears the furnace compartment door is cut too short. 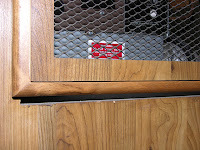 Actually, the decorative grill work restricted the return air flow (reducing the number of square inches through the door), to the extent that this gap below the door was necessary to bring it back within spec. So as the approaching fall months lure us out to see the beauty, proactive coach owners will be diligent about having clean heating system components. 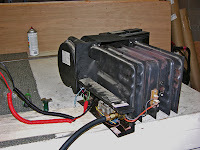 They will also maintain a healthy battery system in order to power the furnace properly. Additionally, they will have inspected their ductwork for obstructions. And you know they will certainly not store cargo in the furnace compartment or otherwise block the path of return air. Keep the above four Key Factors in mind and in practice, and you too can enjoy many years of warmth from your motorhome heating system. Remember, RVing is more than a hobby, it’s a lifestyle!